"I remain committed to push the passage of a law for responsible parenthood." Will PNoy reiterate his declaration of support for the Reproductive Health Bill (RH) in his SONA? Will RH Bill gain headway when Congress resumes? Proponents and opponents of the controversial measure will debate again, this time in 140 characters via the hashtag #TweetConPH. #TweetConPH is the country’s first-ever virtual roundtable discussion organized by Newsbreak together with its newest blogger @I_AmHolo. The “tweetcussion” (read: discussion on Twitter) will be staged on the popular social networking site Twitter using the hashtag #TweetConPH. 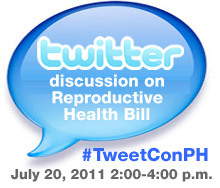 The tweetcussion will be conducted on Wednesday, July 20, 2011 from 2:00 pm to 4:00 pm. guest twitterviewers (read: interviewers on Twitter). Proponents and opponents of the RH Bill who are on Twitter will constitute the panel of twitterviewees (read: interviewees on Twitter). Twitter personalities are invited as twitterviewees. A panel of journalists will be invited as twitterviewers. entertained towards the end of the tweetcussion. @I_amHolo and @newsbreak_ph facilitate the exchange.